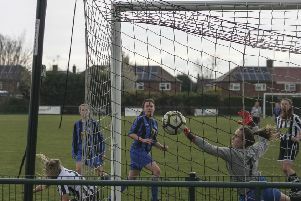 There were no surprises in the second round of the Peterborough Youth League Under 15 KO Cup on Sunday. All six matches played went according to form with three of the top four sides in Division One all chalking up big wins. Glinton and Northbroough Amber led the way thumping Oundle Town 14-5 with Andrew Irvine and Owen Thomas both netting four times. Fife scored his for Division One leaders Peterborough Sports in a 7-2 triumph against Northern Star and Tidswell fired his treble for Netherton in their 5-1 win over March Soccer School. In the other two second round matches played, Whittlesey beat Stamford 3-2 and in an all-Division Two tie Hungate won 6-2 against Glinton and Northborough Blue/Black.